In my last post told you about a dress I was making for Kira for the party. I finished it on time, and Kira looked so cute and super girly in it. The mix of the 2 fabric's and my favorite ribbon a ricrac. The ballerina fabric I bought to make her a dance bag, but found a other idea, so this is perfect for the dress. When I was pregnant of Kira, the Dutch designer Collie-Collie, designed this dress and I fell in love with it, I didn't know if I had a boy or a girl in my belly ( secretly I was hoping for a girl.. hihi). But if it would be a girl I would buy it. So really 2 hours after I gave birth to Kira, ( I really didn't believe at that time, I had a girl) I bought the pattern.. The smallest size is 86 for the pattern.. Kira had that when she was 2. I made is for my neighbor girl, made it twice for a other girl, but still hadn't made it for Kira. Shame one me.. I loved it so much, And now when is is almost 4 ( in 6 months.., hihihi) I made it for the first for her!! For now the has enough dresses for the summer, so the next will be for winter. As you can see she is all girl, with her hair and jewelry.. she really loves that..
Braiding the hair is my new addiction.. I really love it.. I have a pin board on pinterest, and often I get pictures send on my facebook, so I;m trying new things.. 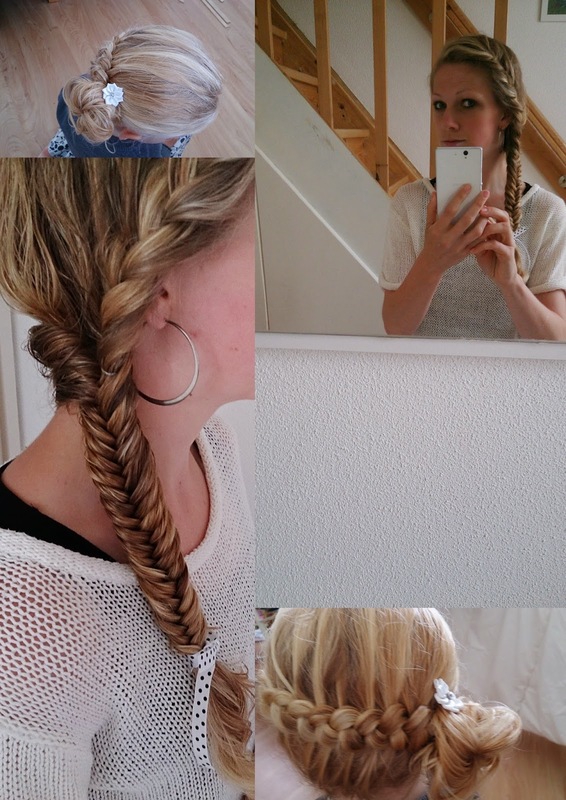 This braid I made so often with Kira, but I didn't like the end of the braid hanging like that, I tryed ceveral options, but it still wasn';t it.. But today I found it!! So the side braid for Kira, with a messy bun and then a little flower in it.. I wanted to crochet one, but i didn;t had time, it's on my to do list for this week.. I;m in love with this way.. need to try out some new braid, with a messy bun..
And what about my hair.. found the tutaorial last night. The total braid is called the Bohemian Side Braid. For a first try I really love it..
No hair in my face, and it looks pretty I think. On her blog I found more beautifull hair styles.. so more to try out!! And I love how long her hair is.. hope mine will grow a bit more!!! BTW bad pic's of my hair.. all the pic's that DH made, where to close by, and mine to far away!! Need to work on that!! Right below the pie's, a apple pie, whipped ice-cream pie and carrot-pie. I also made a lunch this time. 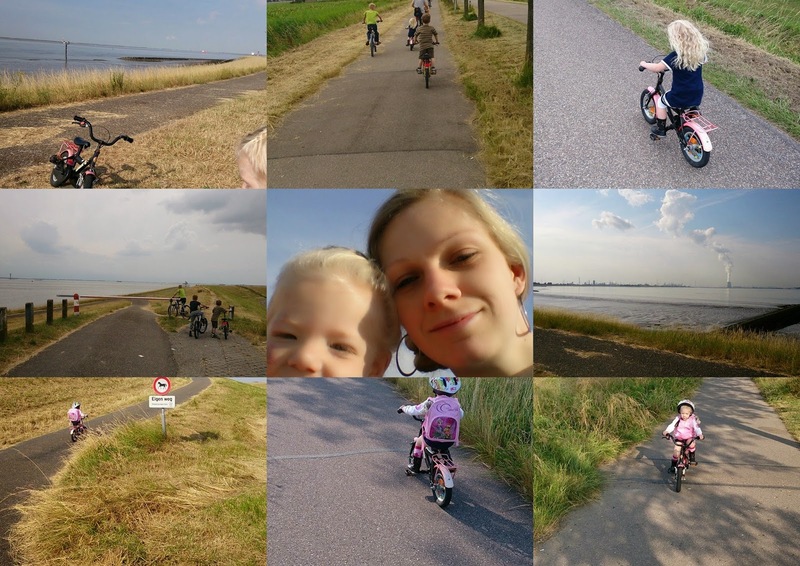 This last weeks we often had beautifull day;s.. we are really enjoying them!! The dike is my favorite to go too..
Mostly I go with Kira, as Noah is often at school. but in the weekend, Noah and sometimes his friend go with us!! I'm feeling so much better with my new working outs ,.... and loving it. This morning came out of the night shift, so now a few day's off.. next weekend I have to work again.. The dress is beautiful, worth waiting for. Kira and you look gorgeous in those braids. I've never seen one with that fishtail effect. Fun to do these Mother/Daughter girly things, huh? Prachtige jurk, staat haar goed. Wat sneu dat ze is gevallen. 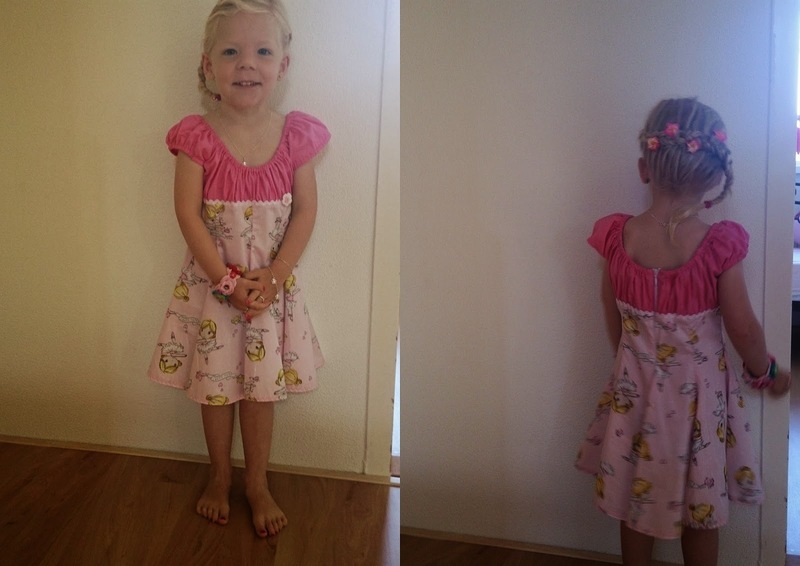 Lovely and pretty dress for Kira, she looks so beautiful . What could be better out with your family having fun. Leuk zeg dat harenvlechten. Mijn dochters zijn daar ook altijd mee bezig,maar jouw visgraat vind ik wel heel erg mooi. Prachtige jurk voor Kira. Wens je een mooie week toe. groetjes. Wat een mooi vlechten. En wst een mooi prinsesje. Jammer dat ze zo vervelend gevallen is. I must say that she looks fantastic in the dress...congrats for your work! I never had hair enough for braids even though I find them so awesmoe! Congrats! I hope Kira wasn't put off cycling after falling off. She did get a bit bruised! Alleen 2 uur na de bevalling...OMG ik zou er niet zo snel op zijn gekomen haha. Beautiful pictures of you and Kira. and wow! 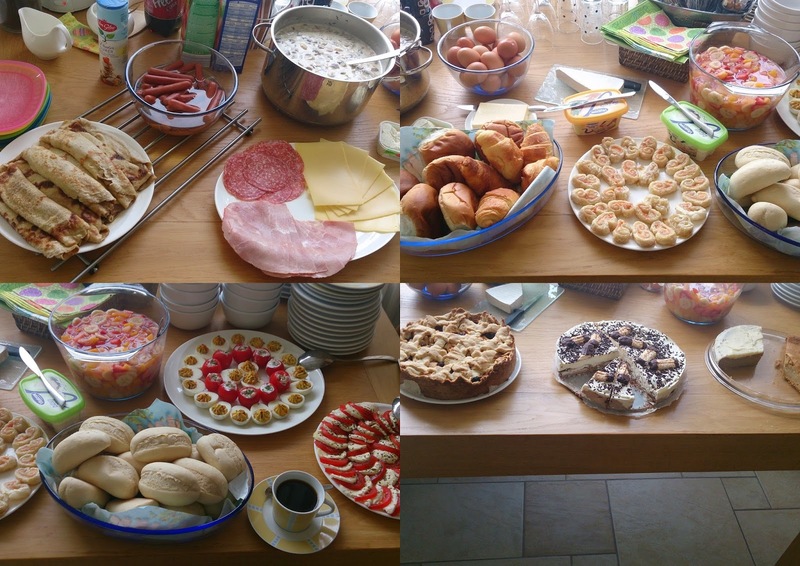 such yummy foods! Autch :( Kira is hurt bad!! :( i hope she didn't get scare to jump on the bike again! Kira's dress is just so wonderful!! :) you sew so pretty!! Her hairstyle looks lovely too. I hope she is fine and enjoying the bikes now. omg!! I sooo love the dress you made!!! So beautiful!! And Kira looks lovely on it!! You are really talented!!! Loved it! !